Rare Gem Property in Miami! Excluded dog breeds include: Akita, Alaskan Malamute, American Bull Dog, American Pit Bull Terrier, American or Bull Staffordshire Terrier, Bull Terrier, Chinese Shar-Pei, Dalmatian, Doberman Pinscher, Presa Canario, Pit Bull, Rottweiler, Siberian Husky, Stafford Terrier, Chow, German Shepherd and any mix thereof. Letter required by Certified Veterinarian for proof of breed, weight, and required vaccinations. Pet Rent: $25 per pet. Please see a Leasing Professional for a listing of all fees and monthly charges. Paystubs, W2, Letter from Accountant, Bank statements. Everyone must qualify to live at our community. As long as the unit is left in good condition. Yes, but a penalty will be charged. Yes, but a MTM fee will be charged. No utilities are included in the lease. We offer 7-15 month lease. Yes we require renters insurance. Yes, we can provide furnished units. No, at this time we are not offering corporate units. Go to our web site and set up a service request using your resident portal information. The rent is due on the 1st of each month. On 4th you will be liable for a late charge. Yes you must notify the office of any staying more than 2 weeks. Yes you may install a satellite dish as long as it is properly installed by a licensed technician and an additional deposit must be paid. No we do not provide cable service. Yes; it is open 24 hours for your convenience. We are still working to determine the municipality's service capability. Yes we do offer storage spaces for a monthly fee. Yes if it is returned to the original condition upon move out. No, the office will not accept packages. Head North on Biscayne Blvd. Turn right onto 79th Street Causeway/John F Kennedy Causeway. Turn left onto Harbor Drive. Turn left West Drive. Continue to follow West Dr. to Moda North Bay Village. Head South on Biscayne Blvd. Turn left onto 79th Street Causeway/John F Kennedy Causeway. Turn left onto Harbor Drive. Turn left West Drive. Continue to follow West Dr. to Moda North Bay Village. Head East on 836 to 195 (Beaches) Exit on Biscayne Blvd. North.Head North on Biscayne Blvd. Turn right onto 79th Street Causeway/John F Kennedy Causeway. Turn left onto Harbor Drive. Turn left West Drive. Continue to follow West Dr. to Moda North Bay Village. Emerging from the booming North Bay Village area and built overlooking Biscayne Bay, Moda North Bay Village is the premier location for stylish, modern apartment homes in Miami Beach, FL. 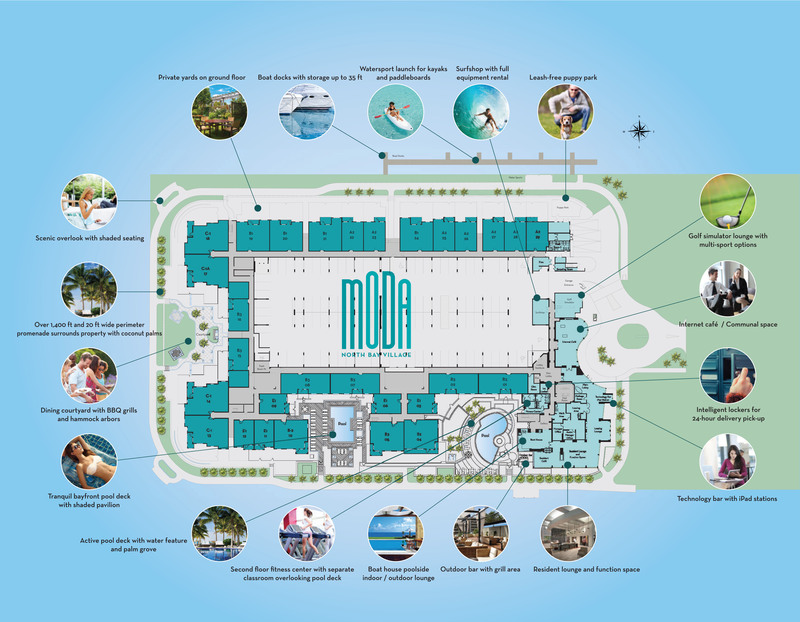 Featuring brand-new luxury apartments, Moda is located perfectly on the North Bay Village islands, just moments away from both Miami and Miami Beach. These newly developed luxury apartments are built to follow the visual legacy of 1950s art-deco, with bold geometric motifs and breathtaking city and water views & perfect for high-style living in the prestigious North Bay Village area. Our striking North Bay Village, FL apartments feature granite countertops, keyless entry systems, and vertical spas in most units. With our North Bay Village apartments that feature world-class amenities, Moda brings the finest in Gold Coast living to the historic three island paradise in Biscayne Bay. If you are looking for a studio, one, or two bedroom (with den options available too!) apartment home with uncompromising quality, look no further than the most luxurious apartments in Miami Beach, FL at Moda North Bay Village.